When Alchemy Oils got in touch with me and asked if I would be interested in reviewing one of their hair oils for me, I jumped at the chance. I'd heard so many great things about this brand from other bloggers that I was so excited to try their stuff so when one of their amazing hair oil's landed on my doorstep, I was testing it out right away! About Alchemy Oils: At Alchemy, they believe in simplicity which is why we create a blend of just give super oils, nothing added and nothing taken away so that your hair absorbs everything it needs to be strong, healthy and manageable. Alchemy Oils has taken the age old Ayuredic practice of hair oiling from India and combined it with Western hair styling sensibilities and needs. About the Grapefruit Hair Oil: A nourishing blend of five super oils to improve the condition of and strengthen your hair from within. Made with Coconut, Avocado, Almond and Castor oils which all work in sync to promote growth, thicken hair and impart a lustrous shine. It is topped off with a citrus scented Grapefruit oil, a potent oil which fights dandruff and keeps your scalp healthy. 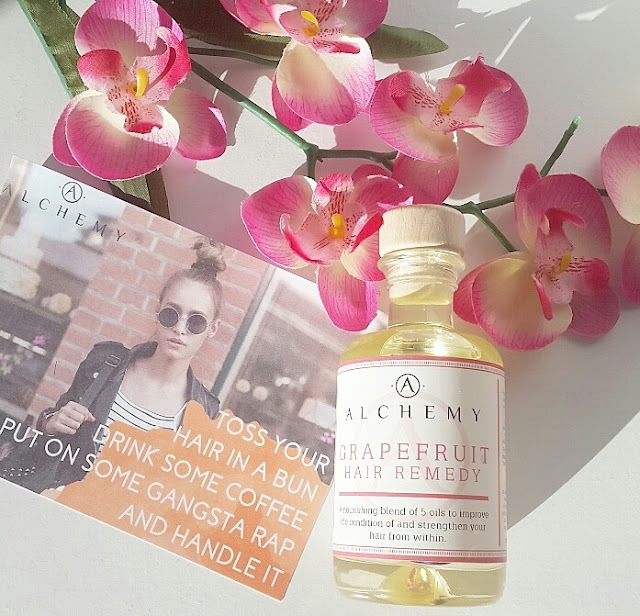 I wanted to try the Alchemy Grapefruit Hair Oil* for myself more than the other products they have because it tackles dandruff prone hair, which is something I suffer with massively. I'm pretty sure I've mentioned this on my blog before actually. Not only does it fight dandruff but it also thickens hair, conditions hair and enlightens hair - how brilliant is that?! The packaging of the bottle is wonderful, its so natural and a little vintage, and the smell of the product inside is beautiful. Very clean and fresh which I love A LOT. I've been using this product for a couple of weeks and I have noticed a massive difference in my hair: it's thicker, smoother and I'm getting less dandruff which I am more than happy about. I also love that their are not only cruelty-free but are also vegan too. I literally can't rate this brand enough. The Alchemy Grapefruit Hair Oil* is priced at £24.00 and you can buy/check out the product for yourself by clicking here. Have you tried any of the Alchemy Oil* products? What are your thoughts? Obsessed with products that contain natural oils! I've never tried this brand before so I'll definitely be putting this on my wish list! Also I've just shared my favourite night-time skin favourite on the blog so I would love if you could give it a read! I tried this one too, I absolutely loved it! Such a good oil and it leaves your hair feeling absolutely amazing! I get a slight touch of dandruff every now and then (normally when I've been neglecting my hair) so I would definitely be interested in trying this! Sounds an awful lot more appealing than something like head and shoulders. I love the company's ideology that simple oils with only the key ingredients are best, that's something I can totally get behind! I really love the scent of grapefruit, so this product sounds right up my street! It's great to hear that there are so many great cruelty free and vegan products out there like this one! Thanks for sharing! Oooh this sounds absolutely lovely. I bet it smells amazing too. I really don't need to thicken my hair though haha! I've not tried it, but, it does sound lovely! !